What is a gamer? A guy who plays hard, every single down. A guy who gets back up when others would stay down. They are players you respect even though they play for the team you hate. Some are superstars. Some simply play several levels above their combine scores once the game starts. Earlier we discussed the 10 Best Running Backs I remember, and I explained how this category is completely subjective. These posts are in good fun, and based solely on my fading memory – not statistics. Perhaps I’ll forget the most obvious candidate, like when Cris Carter forgot to name Calvin Johnson in his top 5 current receivers on the Mike and Mike Show. I’ll take that risk, however, and hopefully we’ll all enjoy a few good football memories together. 10. Steve Tasker: The man who made the Pro Bowl 7 times as a special teams player. I don’t remember any player having such an impact on the other team’s starting field position. Nobody keeps track of punts downed inside the 10, but my guess is that Tasker is the all-time champ. 9. Chuck Cecil: Hardest hitting man in show business. I remember reading an NFL preview stating, “Cecil hits people so hard, he often knocks himself out of games.” I indeed have vivid memories of Cecil laying on the ground next to the receiver after the hit. You often spotted Cecil on the field four or five plays later. They don’t keep track of Minutes Played with a Concussion either, but my guess is Cecil played quite a few. Here he is pounding another gamer who barely missed the list, Neal Anderson. 7. Tom Rathman: If Waddle’s name is synonymous with smelling salts, Rathman’s is synonymous with mud, dirt, and grime. Not sure if I have a memory of him with a clean jersey on. He did everything exceptionally well: he blocked, he ran, he caught the ball out of the backfield. In 1989, he even bested John Taylor’s reception total. Only Jerry Rice had more on the 49ers. 6. Kellen Winslow: “The Epic in Miami” is also known as “The Kellen Winslow Game.” Both head coaches – Don Shula and Don Coryell – said afterward that it likely was the best game ever. Winslow notched 166 yards receiving, scored a touchdown, and blocked two field goals. He battled more than the Dolphins that day – he suffered dehydration, cramping and a pinched nerve. The iconic photo of his teammates carrying him off the field makes it one of the most famous NFL performances ever. 5. Ronnie Lott: Okay, there’s a lot of folklore around Lott. The truth is he chose to have part of his finger amputated in the off-season so he wouldn’t miss any regular season games. That ballooned into a myth that he was on the sideline, in the middle of the game, and told doctors to cut off his finger so he could play the next series. The fact that version is even remotely believable tells you what kind of player he was. He was, however, “stunned” after the surgery. 4. Jack Lambert: Lambert may deserve better, but a kid my age only saw about half of his career. Still, I was old enough to recognize that few played the game as hard. Just ask Brian Sipe. Lambert’s one of those players who made 70s football what it was, and helped cultivate the classic Steelers/Cowboys rivalry. I wish I could have seen him play more. 3. Brett Favre: Unfortunately, many fans now just remember his off-field incident as a New York Jet. 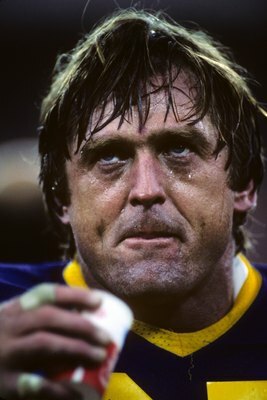 My memories of Brett include watching him cough up blood on the sidelines and throw a touchdown pass on the next play. He played with separated shoulders and severely sprained ankles. With Minnesota, he played on a fractured ankle. If I remember correctly, he played most of a season with a broken thumb. On his throwing hand. And he still led the NFL in touchdown passes. Then there’s the epic Monday night performance after his father died. Gamer. 1. Rocky Bleier: A hero on and off the field. Rocky suffered a gunshot wound in an ambush during the Vietnam War. He continued to fire his grenade launcher “as that was my responsibility, regardless of whether I’d been shot,” he says in The Game before the Money. An enemy grenade also wounded Rocky in the same ambush. Doctors told him to forget about football. Rocky, however, felt he could overcome his war injuries just like he overcame a lacerated kidney and knee injury during his Notre Dame career. Rocky’s recovery took 4 years, but his desire and determination to play football landed him starting roles in all 4 Steeler Super Bowls in the 1970s. One ring for each year of dedication. So many men have played this game with an enduring passion and toughness. Ten doesn’t even scrape the top of the elite. Skill position players are most notable in football, but dozens of lineman are worthy of this list. Ones I remember most are Joe Jacoby, Louie Kelcher, Jim Burt, Jackie Slater, Joe Klecko, Elvin Bethea, Steve Wallace, Randy White, Anthony Munoz, and Larry Allen. There are so many other players I admired for their sheer will: Emmitt Smith, who like Favre played important roles with a separated shoulder. Karl Mecklenburg, Joey Browner, and Jack Ham also stand out to me. Troy Polamalu, Ben Roethlisberger, DeMarcus Ware, Marshawn Lynch, Clay Mathews and Jared Allen are some of today’s players I would call gamers. Gamers tend to be our favorite players. Who are your favorites? NOTE: You can read the stories of Jack Youngblood, Rocky Bleier, Louie Kelcher and Elvin Bethea in order from these fine retailers.